Mobile Robotics Software Market size was valued at over USD 1 billion in 2016 and will reach USD 3.8 billion by 2024. 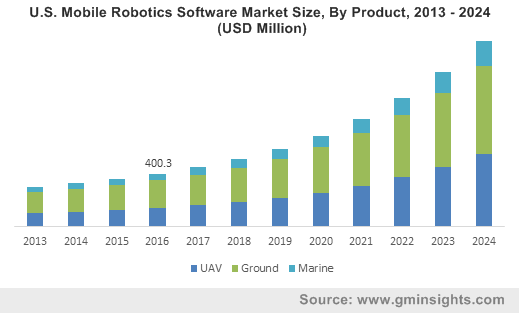 High implementation of robotics across various applications including healthcare, logistics, and military & defense is anticipated to escalate the mobile robotics software market share. The software is used to perform autonomous tasks and is incorporated into hardware components by using various programming languages such as C, C++, and Java. Many frameworks and systems have been aligned to make the robot programming simpler. Moreover, it allows autonomous task accomplishment or lets the user remotely control the robots. The industry penetration is strengthening owing to constant technological advancements such as incorporation of maps and navigational systems into robots. Advancements in military & defense operations involves development of highly specialized expertise and custom-built tools. They are further used to mitigate the related product development risk in essential areas such as modelling, testing & verification, multi-core, and performance engineering. High government funds across the globe will induce immense potential to the mobile robotics software market size over the forecast timeline. Industry players focus on developing the product with enhanced in-built software for logistics application. For instance, Clearpath Robotics manufactured OTTO motors, an autonomous vehicle that has high payload capacity. Uncertainty about the product performance and technical glitches associated with the software are likely to present a threat to the industry. Low awareness among consumers about benefits of this software will hamper the industry growth over the forecast timeframe. Mobile robots for ground, i.e. unmanned ground vehicles are anticipated to account for over 50% industry share by 2024. This can be attributed to rising demand from defense sector for accomplishment of inconvenient and hazardous missions. High dependence on these UGVs for logistics, and Inspection & maintenance will further escalate industry demand from 2017 to 2024. Unmanned aerial vehicles (UAV) is projected to grow at highest CAGR of over 19% over the coming years owing to rising investments for development of these autonomous vehicles for efficient product delivery systems. In addition, rising demand from e-commerce and online retail companies for enhanced delivery system has forced them to invest in UAVs. For instance, Walmart and Amazon have authorized Federal Aviation Administration (FAA) license for testing delivery systems of these drones. This will support the industry growth during the forecast timeline. Government initiatives for adoption of UAVs has propelled the industry growth. For instance, US Government passed rules regarding UAV implementation for civilian purposes. Professional applications are anticipated to dominate the mobile robotics software market over the forecast timespan. High implementation of these robots in defense sector for surveillance, inspection and security will result in increased production. Healthcare sector is likely to exhibit significant share in the industry owing to continuously rising mobile robotics software deployment in hospitals and health centers. Industry participants are focusing on development of navigation control system for healthcare sector. For instance, Aethon Inc. developed MedEx software for robot navigation control. Logistics and telepresence are also anticipated to grow at significant pace owing to rising mobile robotics deployment in these applications. Personal applications will grow at an exponential rate from 2017 to 2024 owing to rising implementation of robotic vacuum cleaners and lawn movers for domestic cleaning. Increasing usage of these robots in smart toys and other entertainment areas will support the personal applications mobile robotics software market growth during the forecast timeline. North America mobile robotics software market is anticipated to account for largest industry share of over 36% over the coming years owing to high implementation of the product in U.S. Well established market has strengthened the penetration in the region. Rising adoption in domestic applications such as lawn moving, floor and vacuum cleaning are gaining prominence that will escalate the regional growth of mobile robotics software market over the forecast timespan. Asia pacific mobile robotics software market is expected to grow at exponential growth rate, over 20% during next seven years owing to rising awareness regarding mobile robotics in the region. Emergence of various industry players in developing economies of China and India will strengthen the penetration of mobile robotics software in this region. Moreover, rising investments in these countries and favorable regulatory landscape will fuel the regional mobile robotics software market growth. For instance, due to Made in China 2025 initiative by Chinese government, various automobile manufacturers in the country are focusing on establishing new facilities with incorporation of modernized robots that will increase the production of mobile robots in the country, further escalating the industry size. Increasing defense applications will also fuel the regional growth. ABB Ltd. Aethon Inc., Omron Adept Technologies, Brain Corp., SeeByte Ltd., KUKA Ag, Fetch Robotics, RE2 Inc., Geckosystems Intl. Corp., and iRobot Corporation are among prominent participants in the mobile robotics software market. Other notable industry players include Accelerated Dynamics, Liquid robotics, Lockheed Martin, Locus Robotics, and Universal Robots. 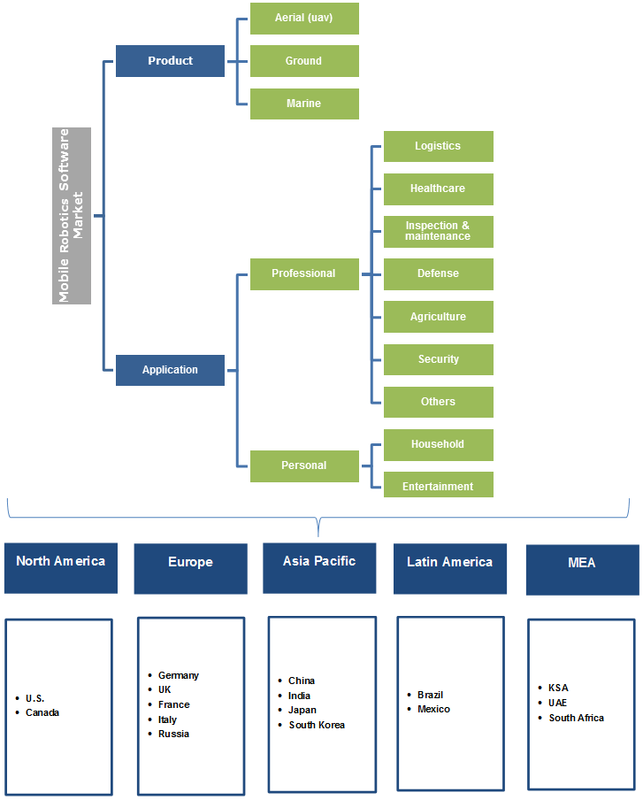 Mobile robotics software market players focus on alliances and strategic partnerships for strengthening their foothold. For instance, In June 2017, Fetch Robotics entered a strategic partnership with distributor and integrator, ONExia. This partnership allowed ONExia to support Fetch Robotics’ software and hardware solutions to Mid-Atlantic. In October 2016, Brain Corp. partnered with minuteman international for incorporation of Brain Corp’s software, EMMA into their products. Later that year, the company partnered with NSS Enterprises for EMMA’s usage in their cleaning equipment. Industry participants are also indulged in expansion of their regional presence. For instance, in June 2017, Universal robots opened their regional offices in Delhi, Munich, Bangalore, and Prague. This will help the company to enhance their global presence and customer base. Mobile robots are autonomous robots with in-built mobility. They follow a fixed path unlike conventional robots. rising workspace efficiency concerns will positively impact the demand of these robots in the forecast timeframe, supporting the growth of mobile robotics software market. Government support across the globe has induced an immense potential to the industry size. High implementation of in China has fueled the industry growth tremendously. Guangdong in China decided to invest approximately 155 billion USD for installation of these robots in various application areas. This will escalate the production of to a great extent. Mobile robot manufacturers are increasingly making heavy investments to increase their production. Rising automation across various application segments such as automotive, manufacturing, defense & security, and few others has led to increasing popularity of these robots among end users in these segments. It is likely to have a positive impact on the industry growth in the forecast timeframe. Growth in personal service robotics demand will further fuel the mobile robotics software market size by 2024.